In collaboration with Alpha Industries, the designs from the 50 States: Veterans + Artists United tour are produced into a limited number of thirty-six shirts and embroidered patches. Click the product images below to purchase Bob and Andrew’s collaborative “Chase” design exclusively on AlphaIndustries.com. After spending a night in a Walmart parking lot in Summerville, we pulled into to our campground in Hollywood, SC greeted by sunshine and holiday cheer. South Carolina was where we saw our first palm tree on the tour, which was a welcomed sight after experiencing our first snow just a few days earlier in North Carolina. As Michiganders, palm trees and Christmas don’t exactly go hand-in-hand, but if this tour is about experiencing the local culture in each state we visit, then palm trees and Santa Clause were things we were happy to get behind in order to join in the local holiday spirit. As creepy as he may look, he’s been around since 1892 as an advertisement for a local haberdashery. Apparently he is comprised of 16 hats in 12 different hat styles, but we didn’t exactly spend the time to play “I Spy” to verify that fact. The rest of downtown Charleston was covered in our first taste of Southern-styled charm that included ivy-covered walls, cobblestone streets, weathered paint finishes, decorative rod-iron railings, oh, and a Pineapple Fountain. This fountain wasn’t the only pineapple we saw. We began noticing on homes, gates, mailboxes, and more. Come to find out, the pineapple is a southern symbol of hospitality especially present in Charleston. Legend has it that pineapples were often given as friendly gifts and were featured as centerpieces in homes and at celebrations amongst friends, eventually becoming a design detail incorporated into a home’s architecture and decor. Just south of the Pineapple Fountain in Waterfront Park that overlooks the Charleston Harbor is a stretch of Southern-style mansions known as The Battery. It’s hard not to imagine yourself back in time when you walk by these mansions, which as beautiful as they are also come with a tainted past when you think of the likely source of how families could afford such lavish living. I’m sure you’d get some of the local history if you were to take a guided walking tour or if you’re really feeling like taking a trip back in time, a horse carriage ride. Being on the budget we’re on, we opted for the free walk-about option which was just as insightful thanks to my love of Wikipedia. Plus, walking around is usually our best bet for getting any exercise while living and working on the road. Beyond the extravagant homes, you can’t help but admire the incredible oak trees that must be centuries old. As we walked through White Point Garden, we lived in the moment as the sun peeked through the giant vein-like branches. Amongst the charm and beauty of Charleston, we couldn’t stop thinking about its darker past. Known as the Old Slave Mart, this building was renovated by the City of Charleston into a museum that interprets the history of this region’s role in the slave trade. According to the Old Slave Mart website, more than one million American-born slaves were sold away from plantations in the upper South to work the rapidly expanding cotton and sugar plantations in the lower South. In Charleston, enslaved African Americans were customarily sold openly in public until a city ordinance in 1856 prohibited public sales that led to the opening of the Old Slave Mart and a number of other enclosed sales rooms, yards, or marts in the area. The Old Slave Mart is believed to be the last existing slave auction facility in South Carolina until its closure in 1863. A recent New York Times article states that an estimated that 40 to 60 percent of African-Americans can trace their roots here. Learning all of this information while looking across the street at the building where this all happened was simply heartbreaking. We didn’t know what to say or do or feel — we were left frozen in place and found ourselves speechless yet full of every emotion of anger and an incredible sadness that makes your heart drop and nearly sick to your stomach. We knew this was part of our country’s history, but this was the first time we experienced it face-to-face in such a direct manner. To say the least, it had a lasting impact on us that we continue to carry with us on this tour and beyond. From where we were staying in Hollywood, we realized we were closer to Savannah now than we will be during our Georgia project later in 2019 when we’ll be in the Atlanta area. Not sure if we’d be able to make it there when we’re back in the southeast later in the tour, we decided to make the day trip to the “Hostess City” so not to miss out. We didn’t really have a plan of action other than walking around Savannah’s historic neighborhoods that featured parks, statues, and fountains on just about every block of beautifully-aged homes, architecture, and moss-draped oaks. Needing to get off our feet for a bit and a little afternoon jolt, we enjoyed a couple fancy coffee drinks before we set back out around the neighborhoods, eventually making our way to the renowned SCAD, the Savannah College of Art and Design. Unfortunately there were no exhibits or shows happening at the time, but we were able to console ourselves with some ice cream, instead. One site of interest that we did set out to visit while in the Savannah area was the Wormsloe Plantation. In 1733, English carpenter Noble Jones first settled here as one of the original founders of Georgia after he was granted 500 acres of land previously inhabited by the Yuchi and Muscogee Creek tribes. The large plantation house on the property was later built in 1828 by Noble’s grandson. The property was fortified during the Civil War by the Confederates and then seized by the Union forces before it was eventually returned to the family. Since then, the plantation has been passed down generation after generation until the majority of the property was transferred over to the State of Georgia in 1979, opening it up to the public as an historic site. Although, the descendants of Noble Jones still control Wormsloe House as a private residence and its surrounding acreage. Seeing the Old Slave Mart and then visiting a plantation where I could only imagine a countless number of those slaves ended up was another life-altering perspective for us and the horrific history of the country we call home. 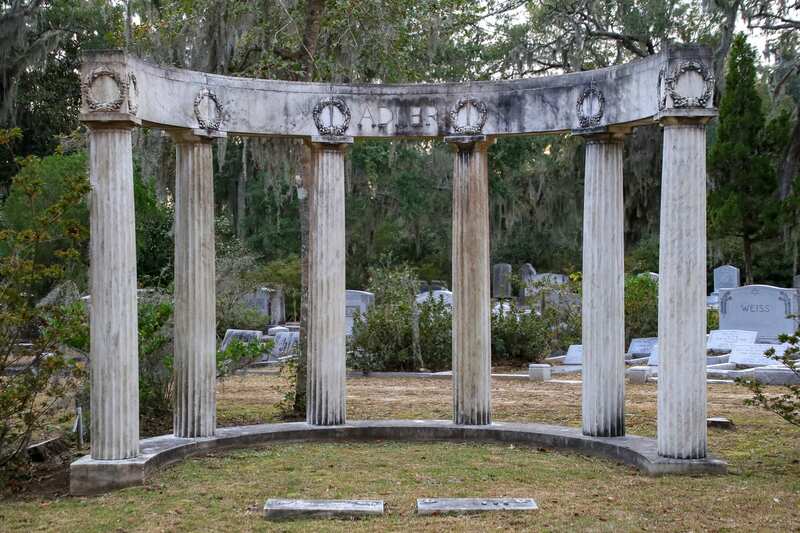 To conclude our southern tour down the haunted history of the south, we were highly suggested to visit one of the most beautiful cemeteries in the world: Bonaventure. As horrible and haunting some of these places may seem, there is also a lush beauty that engulfs them. We can’t change our nation’s history nor our own personal pasts, but we can control our actions and aim towards the future we wish to see.